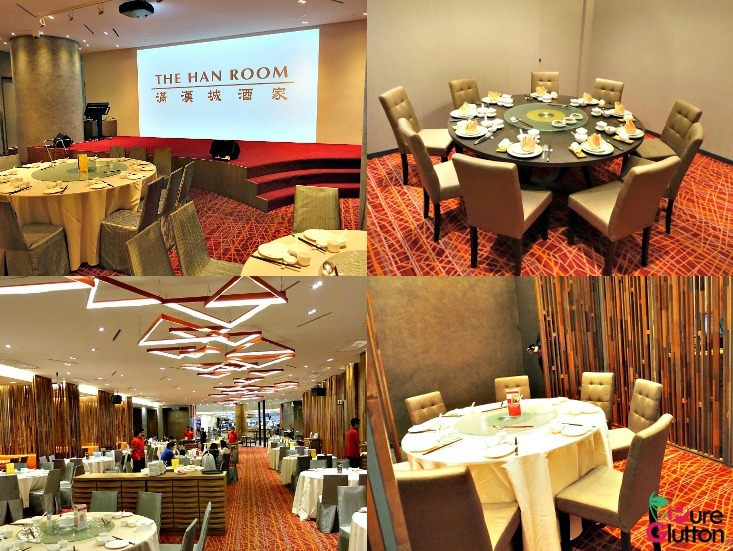 The Han Room’s new location at The Gardens is so much more spacious and comfortable, of course. 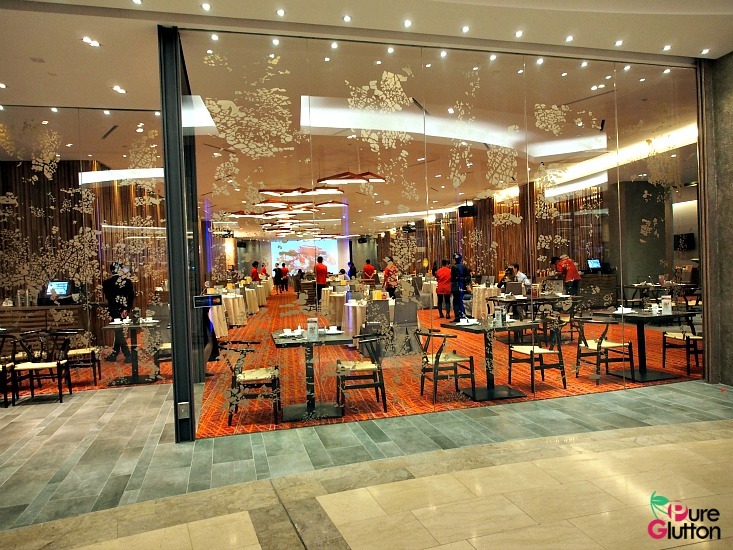 The floor-to-ceiling glass wall at the entrance gives it a lovely “vastness” that allows passers-by to appreciate its chic modern interior. 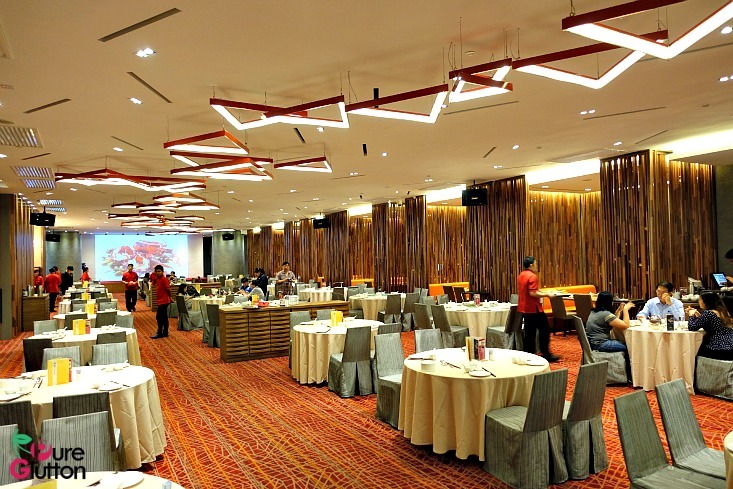 There’s a lot more functional space which allows an even placement of tables, unlike the old location. At one side of the restaurant, there’s space to place some really cosy sofa seats with tables as well as several private rooms. The contemporary designs of the carpet, angular light fittings and clever modernistic vertical wood-stripped partitioning are a welcome sight indeed. The artistic blend of all these elements set the stage for some of The Han Room’s unique offerings. 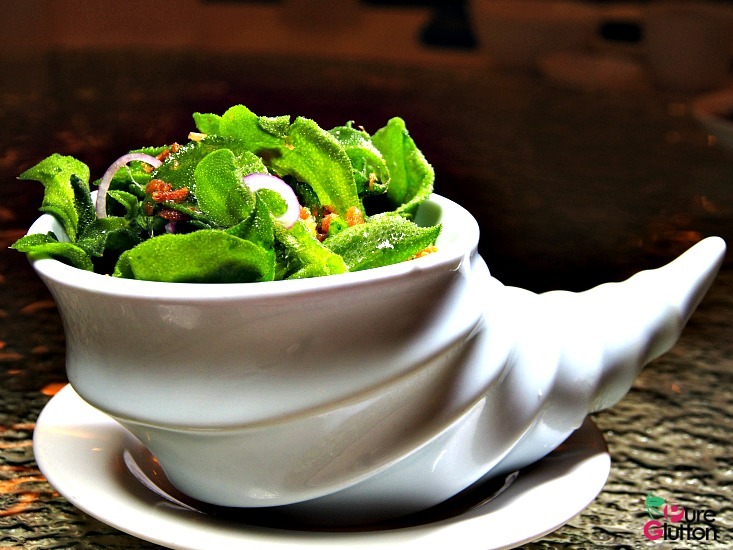 While still admiring the decor, we were quickly served with The Han Room’s signature Ice Plant Salad (RM28). This was the first time I encountered this unique greens which are imported from Japan. They have to be kept in ice to remain fresh, hence the name. The textures of the greens are both crisp and juicy, a unique combination for sure. 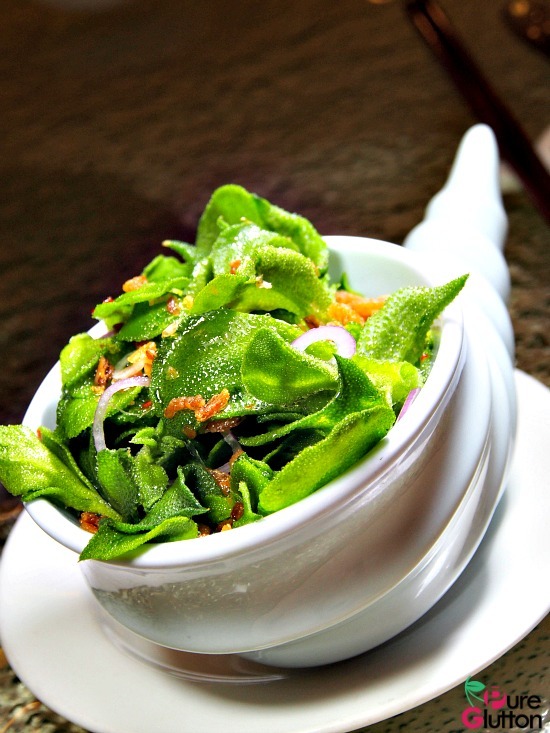 A light zesty spicy dressing with shredded onions and dried prawns flavoured the salad. 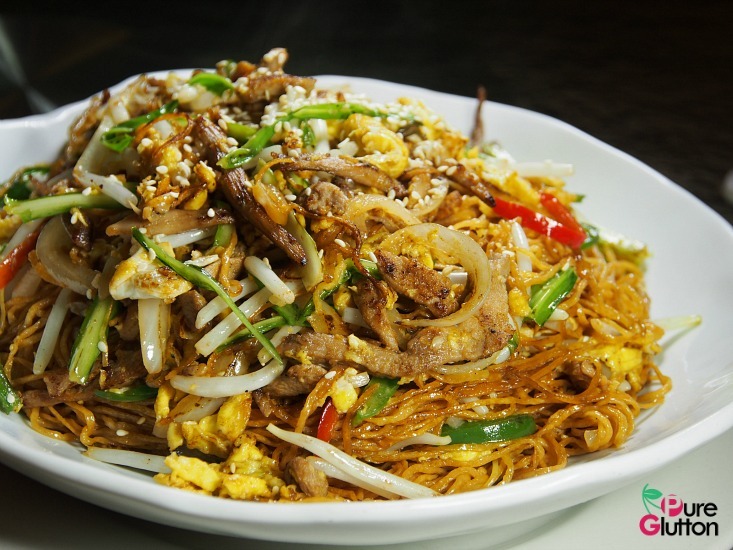 I couldn’t stop eating this and could have easily devoured a second or even third helping – divine! The chefs at The Han Room love experimenting with “more westernised” ingredients and I’m so glad their Prawn & Foie Gras Toast (RM28) turned out to be so good. 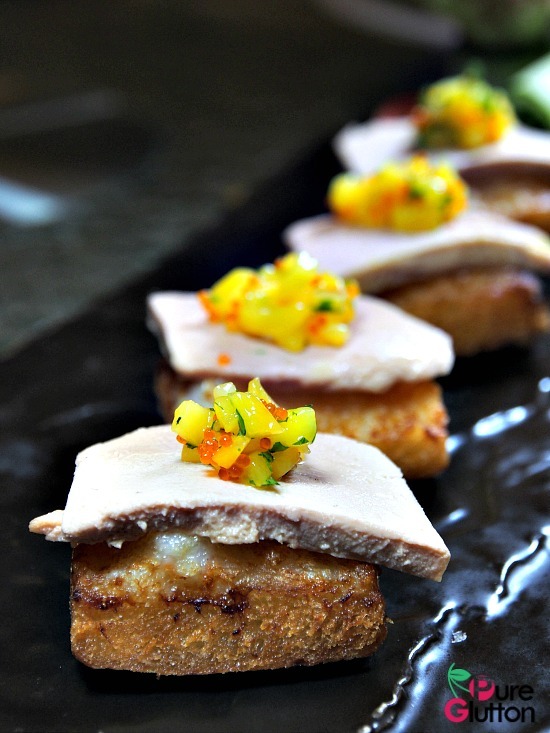 Looking very much like some fine canapés, these petite toasts were to-die-for. You just have to admire the unique pieces of tablewares in The Han Room. 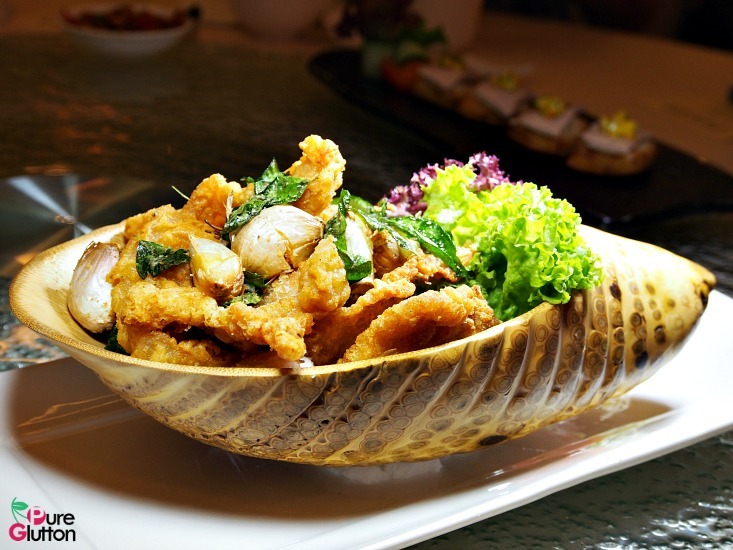 The Crispy Pork Belly with Garlic (RM38) was served in a striking giant shell. Whole unpeeled garlic pips were fried together with the crispy pork belly and together with the curry leaves, this was a super-aromatic dish. These would make excellent bites with a couple of beers but they were lovely on their own as well. More pork followed. The Charcoal-grilled Iberico Pork Neck with Garden Greens Salad (RM45) sounded intriguing but it was a little bit of a let-down. The thin slices of pork neck were a tad over-grilled. They weren’t exactly chewy but a minute or two less under the grill would have rendered them superb. 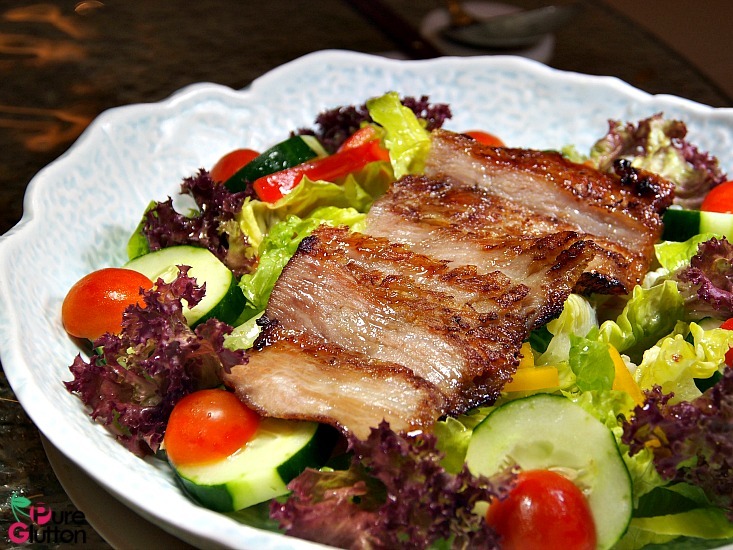 The grilled pork slices were served plainly on a bed of salad greens – I was expecting a more refined presentation, as was the norm with The Han Room. 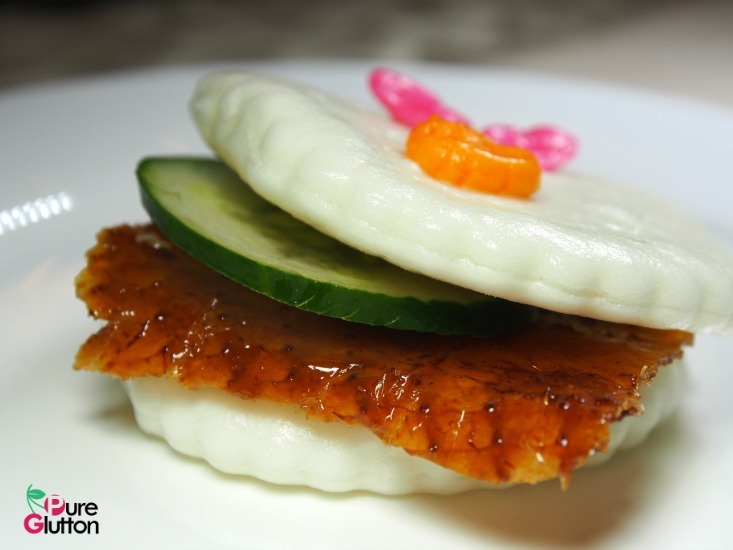 To jive up the glistening Peking Duck (RM118), a basket of cute Piggy Buns was served together. The kids would adore this, for sure. 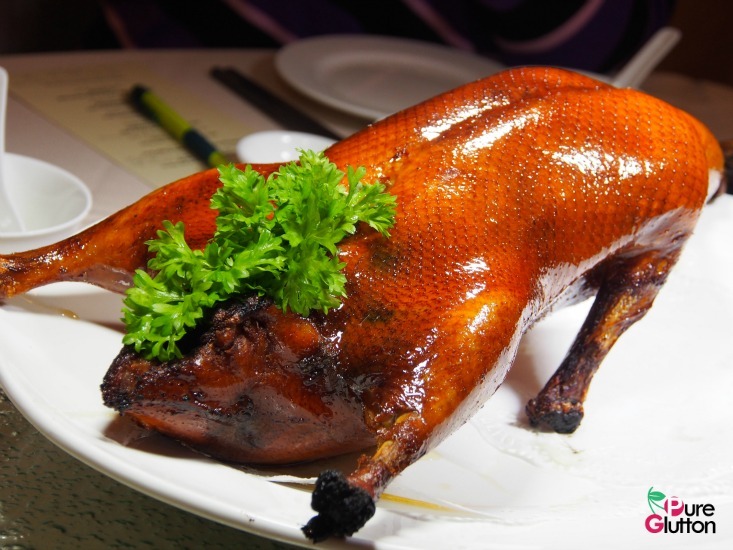 Taste-wise, the golden duck skin was acceptable; strangely, I actually preferred the plate of fried noodles using the duck meat. Just look at that glorious golden skin! 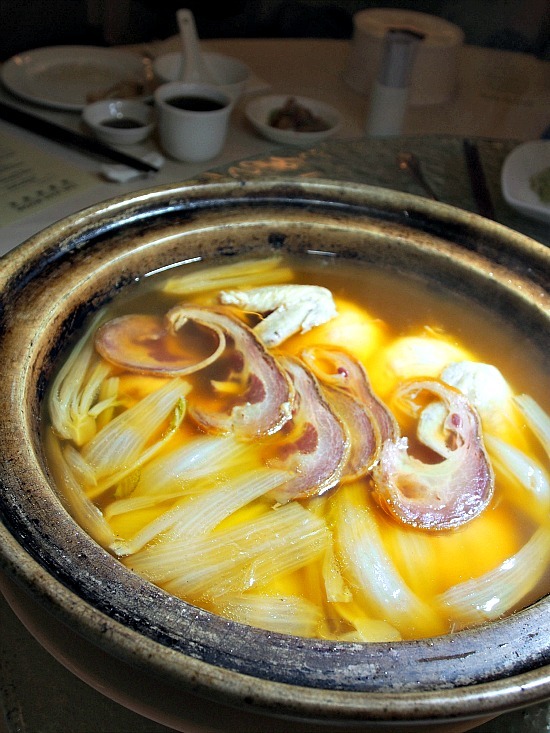 Fish Maw with Yunnan Ham in Superior Stock (RM168) was a most welcome dish on that chilly evening. 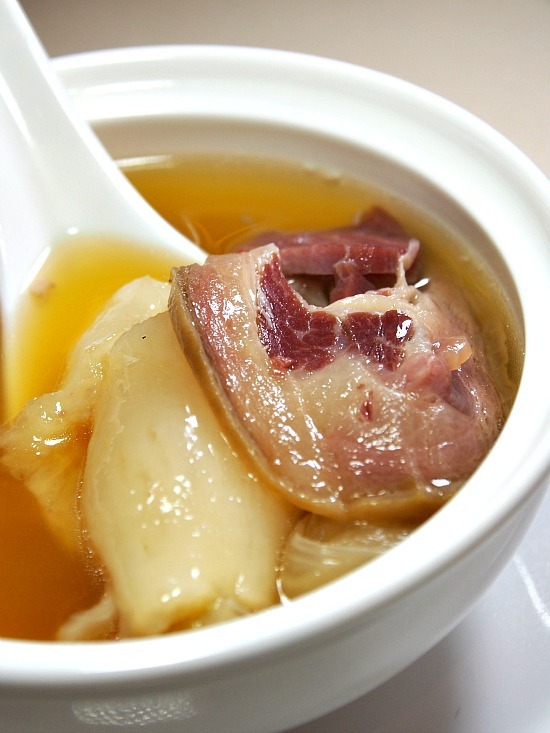 Served in a huge claypot, the soup was wholesomely delicious, having been simmered for hours with the ham. 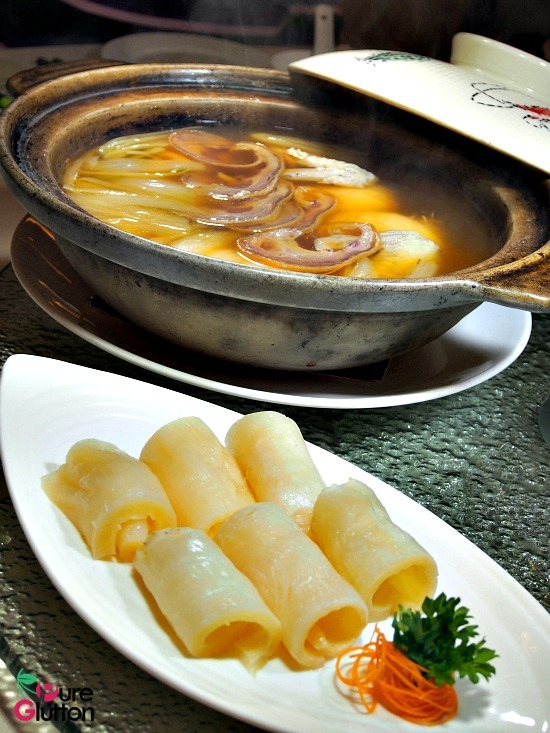 Chinese cabbage added a hint of sweetness to the stock and we slurped it all up very appreciatively. Initially I had some misgivings about the Baked Two Varieties Rice with Seafood in Pumpkin (RM58) especially when I was told cheese was one of the ingredients. 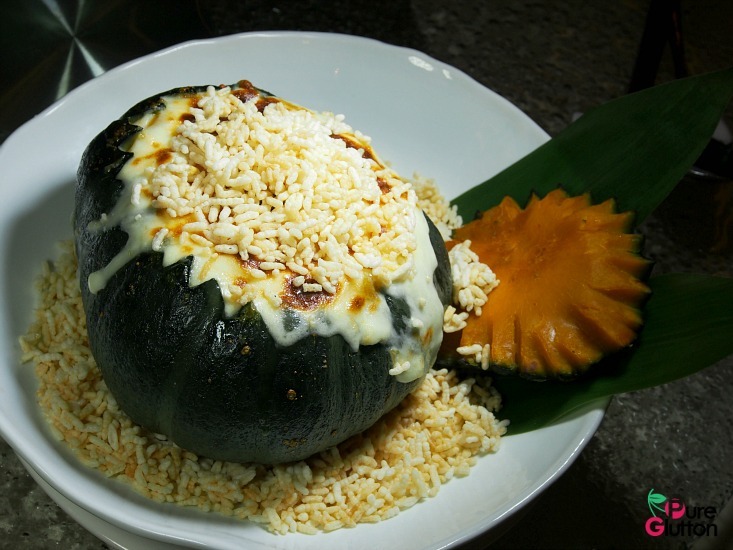 I was thinking more along the likes of those infamous cheese-baked rice very popular in Hong Kong cafes. However, I was wrong as this wonderfully fragrant dish turned out to be a firm favourite that evening. The two varieties of rice referred to the normal rice as well as rice puffs. 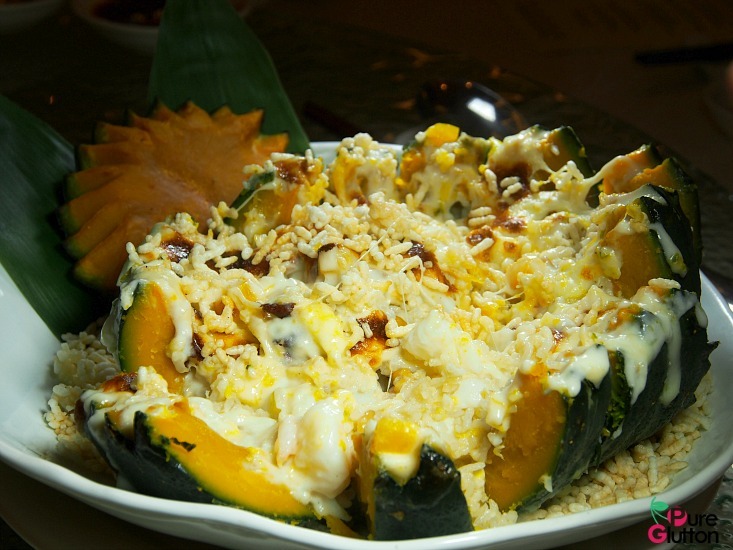 These were all served in a baked pumpkin with shrimps and squids and topped with some light melting cheese. Truth be told, the cheese was not overpowering at all – it merely enhanced the whole dish. It wasn’t surprising that we polished off everything completely. We polished off this completely – really delicious! 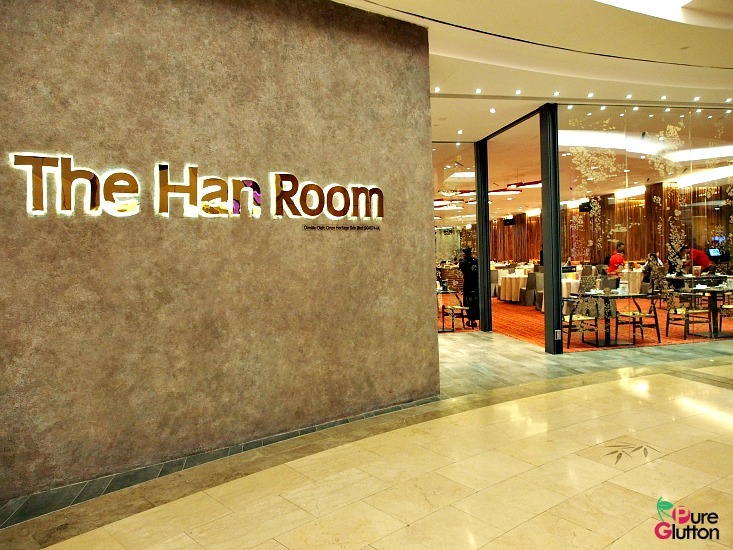 We tried a couple of The Han Room’s new dim sum. 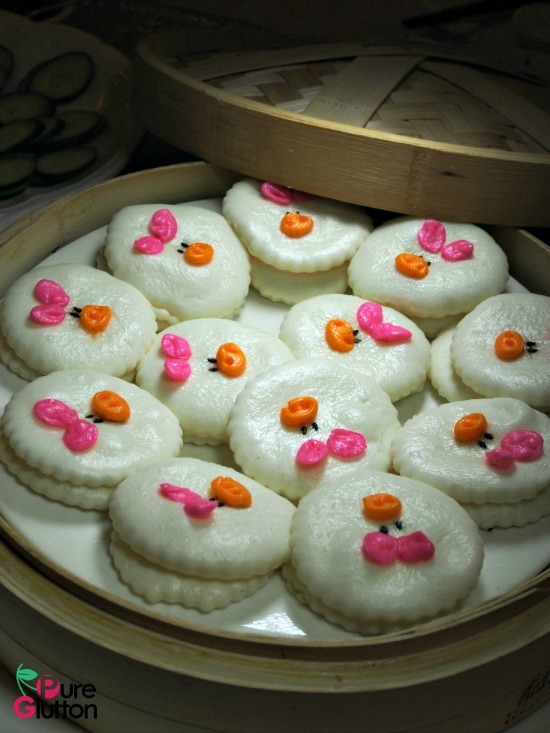 Buns made in the shape of mushrooms are all the rage these days. 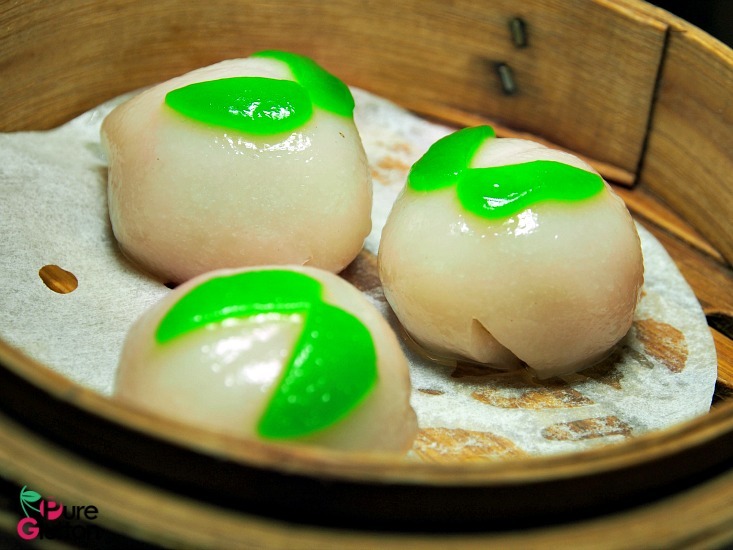 The Han Room’s version had minced chicken filling. Except for its pretty appearance, there wasn’t much distinction in the filling though. 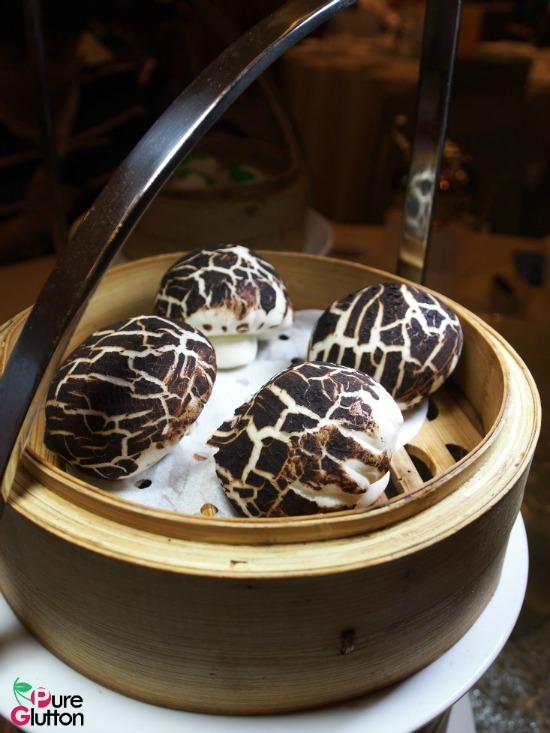 The Crystal Longevity Buns with Macadamia Nuts (RM8/basket) looked promising with its glossy shiny skin. 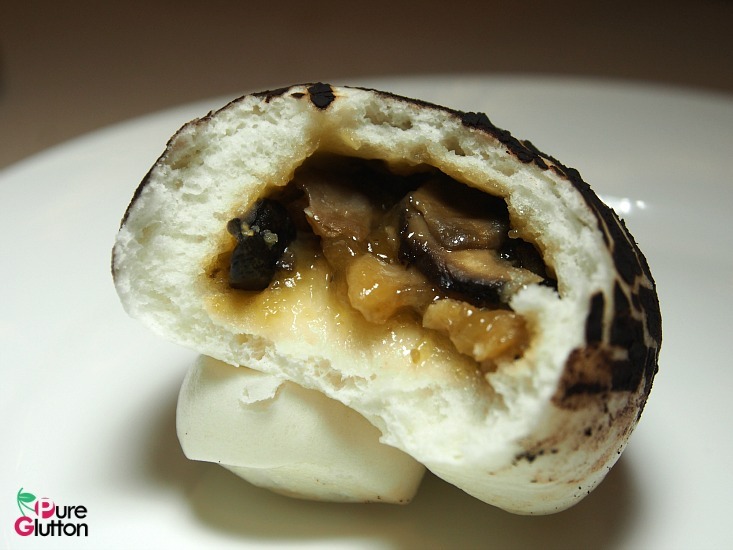 Texture-wise, the skin was kinda chewy and the nutty macadamia filling didn’t really do much in terms of taste. I have a penchant for Cantonese-style soupy dessert so the Chilled Snow Pear & Seaweed Ball in Teapot (RM18) hit the right notes for me. 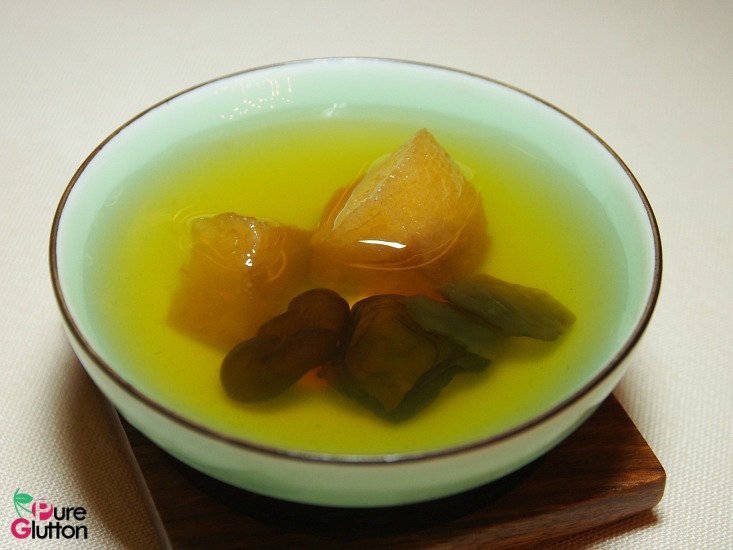 The snow pear had been double-boiled before being chilled and the Cantonese believed this was actually very nutritious. 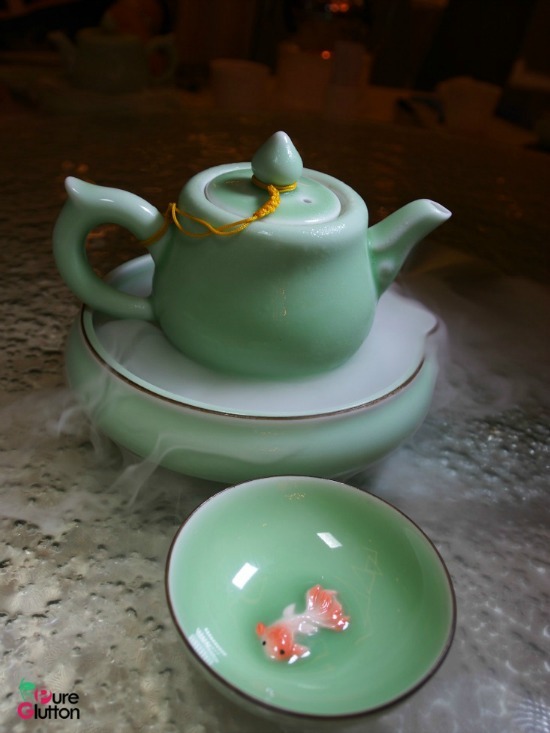 The presentation was conversation-stopping, served in a little green teapot with dry ice giving the visual impression.